best selling titles as Samantha Seagull’s Sandals and Koala Sees the World. 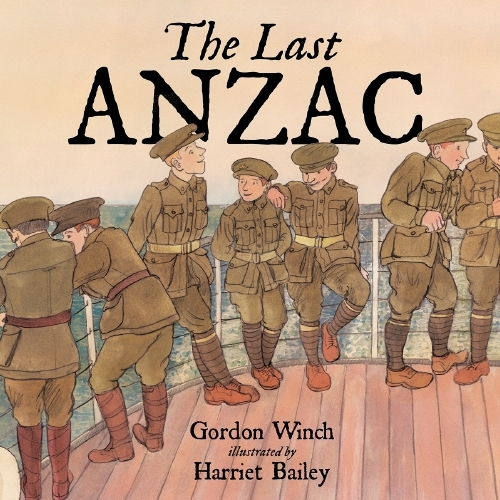 Gordon’s engaging and humorous style makes him a favourite with young readers. Gordon was a teacher for 54 years and has taught many of the teachers now teaching in primary schools across New South Wales. Gordon is committed to children’s literacy; he is on the Advisory Committee of the Dymocks Literacy Foundation and is a member of the selection panel of the New South Wales Premier’s Reading Challenge. Harriet Bailey graduated from Christchurch School of Art and Design with a Diploma in Visual Communications, and worked as a graphic designer. She now lives in Wellington and is freelancing and rediscovering her passion for illustration. Harriet thoroughly researched the history behind The Great War to ensure her illustrations in The Last Anzac reflect the time. Awards and selections include: 2012 Storylines Notable Books, Picture Book 2012 – Hester & Lester, 2012 Storylines Notable Books, Picture Book 2012 – Out of Bed, Fred!, 2010 Storylines Gavin Bishop Award, for most promising unpublished picture book illustrator, 1996 Fraina Trust Scholarship Award, for excellence in drawing. To James, Alec Campbell was a hero. He was right. The old man, the last living ANZAC, and all of the Australian and New Zealand soldiers who fought at Gallipoli, were heroes – everyone’s heroes. Alec, who died in May 2002 at the age of 103, enlisted in 1915 when he was just 16. He had put his age up to 18 in order to be accepted by the army and agreed to fight at the front, wherever he was needed. Heroic indeed! James was very fortunate to meet Alec Campbell and find out about his experiences. He gives us a special view of this humble and remarkable man, the year before he died. It is a remarkable story. Alec Campbell, The Last Anzac, lived in three centuries and died at the age of 103. What great courage to have enlisted at age 16, to fight for his country anywhere in the world! War is in itself a very sad thing: the deaths, the suffering, the sacrifice and the waste of all those young lives. Alec Campbell must have felt for all the ANZACS. Reading about this humble and modest hero made me realise how much we owe to men like him for our freedom and our way of life. There is a painting of Alec Campbell in the Australian War Memorial in Canberra. Australians are showing more interest every year in ANZAC DAY and the stories of all those great men and women who fought and sacrificed their lives for us. I was very fortunate to come into contact with the story of a real boy who made a real visit to Alec Campbell, the year before he died. I had to do a lot or research to gather information to illustrate The Last ANZAC. At the beginning of World War 1, Brownies and other cameras were small enough for soldiers to take along and take snapshots so there was a lot of candid visual material to accompany first hand stories. As well as recording their fellow soldiers, the sheer scale of the steep terrain, which heavily favoured the Turks who were defending their land from high above, was evident. Small watercolour sketches of the Gallipoli and ships at sea were ideal reference for viewing colours as the photographs were only black and white in those days. Photojournalists also visited Gallipoli documenting the conditions through the heat of summer to the freezing snow of winter giving evidence to the authorities of the harsh conditions and why full-scale evacuation was their only option. The Allied evacuation where there was no loss of life was the most positive thing I discovered when researching the ANZACs. The Army was irresponsible in letting many boys enlist who where under 18 years of age. Boys begged their parents to sign their application where they lied about their birthdate. Parents were under the impression that the war would be over in a few short months, even before their son had finished his army training. Boys younger than Alec, some 14 years old, went to Gallipoli, but very few survived to come home. Alec Campbell tells young James he wasn’t injured to while at Gallipoli, that wasn’t the case. While he was in a trench sheltering from an attack a soldier in front of him was shot and fell back and knocked Alec down, possibly saving him from the line of bullets. The soldier’s rifle hit Alec on the head hurting him but not showing any evidence of serious wounding. The injury proved to be much more serious as an important nerve in his cheek had been destroyed and this led to weeks of Bell's Palsy where his muscle on the right side of his face would be paralysed. His eye could not close and he could not smile properly. When he was an old man he lost his right eye so when I was drawing Alec I made sure showed his best side, as I was sure he would have preferred that! In the years after the war it was common for returned soldiers to have a physical injury, surgery scars, missing limbs, blindness or deafness and young children grew up learning this sad fact of war. Alec didn’t make a fuss of his injury because he knew he was lucky to have survived as well as did and he was determined to live his life for the betterment of others. Alec Campbell was a very good long-range rifle shooter having shot rabbits on the farm at home. He didn’t get to man-the-trenches, as his role was a courier of supplies where you had to be strong, nibble and super fast. Being small as he was probably helped to dodge all those bullets. An Australian soldier invented the periscope rifle during the Gallipoli campaign. It worked well in locating unsuspecting enemies from behind trench walls until they learnt to look to for the flash of the sun on the mirror and target the soldier operating it. Alec was among the group of men to great Lord Kitchener, the most senior Allied leader to visit Gallipoli during the campaign. Alec was worried Kitchener would spot him and demand his real age! Alec recalls Kitchener saying, “We were as fine a group of Reinforcements as ever sent.” Kitchener spent two and a half hours touring the ANZAC sector and the impressions he took back to London would help the British government decide to authorise a full evacuation the following month (from “Gallipoli: Our Last Man Standing” by Jonathan King). It was such a well organised evacuation with many tricks invented to make the enemy think they were still there firing guns and detonating bombs that the enemy did not suspect a thing. If you were good at pretending you might have had fun playing fake cricket matches, held to convince the Turks who were looking through their binoculars that all was normal. In reality soldiers out of view were packing up and at night in the camouflage of darkness of night, sneaking quietly down to the beaches in their socks to board long boats to ferry them to the ships that would evacuate them to safety of Egypt.